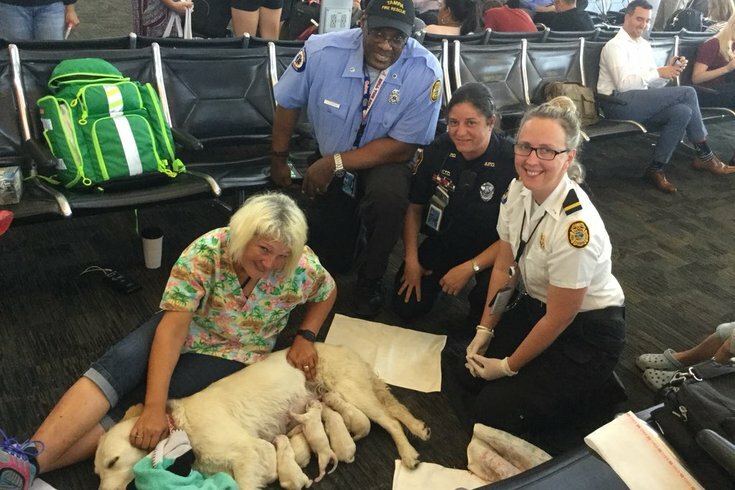 Ellie the yellow lab delivered seven puppies on Friday with the help of Tampa Fire Rescue and Tampa International Airport Police. A service dog was on her way from Florida — with her human, of course — to Philadelphia when she had to stop in the Tampa International Airport to give birth. Her name is Ellie, and she caused quite a stir on the concourse today as she unexpectedly went into labor. She single-handedly started the #AirportPuppies thread on Twitter, so she's done a lot of good today. In the end, the yellow lab gave birth to six girls and one boy with some help from Tampa Fire Rescue and Airport Police. Luckily the father, Nugget, was there for the commotion, too. He looks very proud.